The Centerville Place development consist of a new 36,000 square foot Stein Mart Store with 30,000 square feet of small store retail opportunities adjacent to it situated on a 19 acre site. Architecturally, the Owner requested a return to a more historical design aesthetic to foster a pedestrian friendly environment. TAG responded with a combination of brick masonry, stone veneer and an exterior insulation finish system. Spandrel window units were added to the Stein Mart store to help minimize the scale of the building and foster the idea of a 'second story' while still preserving the interior wall space for product shelving and display. The retail centers, one on each side of the Stein Mart, take their design cues from the anchor store. 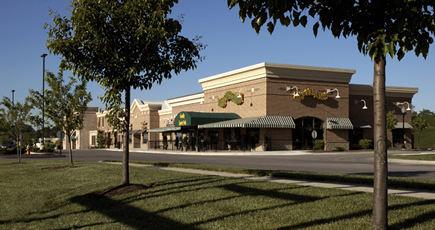 The floor plan of each retail center allows for each retailer to have a unique identity in the overall architectural composition by creating individual 'buildings'. Each 'building' has unique masonry detailing, coursing and lighting. Colorful canopies provide shelter for shoppers while creating an opportunity for individual expression for each tenant.